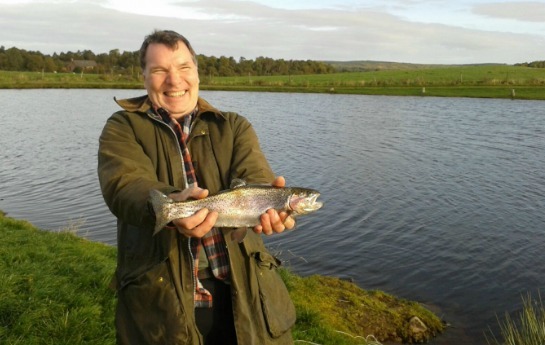 Ruthven House is an ideal base for the vast number of outdoor activities and sports in the area, especially golf, fishing, walking and cycling. Please see below a selection of highlights and links to websites for more information. Visit Cairngorms also has a wealth of information. We would be delighted to make recommendations for you for local attractions, also for dining too. There are cycle routes too numerous to mention in the local area in and around Glen Feshie and the Glen Truim, Etteridge & Phones Estates. Also now open is the exciting new Mountain Biking Centre – Wolf Trax at Laggan. This fabulous new operation has over 6 kms of really challenging Black routes, the same length of testing trails for intermediates and 1.5 kms of fun for beginners. They offer great base facilities too and all this is just 25 minutes away!! The 215 mile cycle route from Glasgow to Inverness (Sustrans Route 7) passes right by our driveway, why not stop over for a night – or even two – for a well earned rest? With more practical considerations in mind, we have ample secure storage for bikes and can arrange for hire and repairs in through Service Sports in Kingussie. Both Kingussie and Newtonmore have an interesting range of shops for you to browse in, Aviemore has an even wider choice and we must not forget House of Bruar and others a little further afield. Kingussie train station is only a 15 minute walk should you decided to take the train for a day out in Perth or Inverness. Do let us know if you need any essentials, we will be able to help or point you in the right direction. The two closest courses are here in Kingussie and just down the road in Newtonmore – 2 very different courses, each very enjoyable and amply rewarding in its own way. There are also a number of other courses within a short drive of Ruthven House – plenty to play during your stay if, of course, Golf is your thing. Kingussie Golf Club offers our residents 15% off their published rates, excludes any special offers and must be booked in advance. On arrival at the Golf Club, you must produce proof of your stay with us, which we will provide you with, to receive your discount. Terms and conditions apply. The restaurant at the Golf Club is thoroughly recommended, especially the Specials Board! Please note the restaurant does not take credit or debit cards. Please note the discount only applies to the golf. Nearby are 3 magnificent mountain ranges – The Cairngorms, The Monadliaths and Nevis range. You are spoilt for choice with an excellent selection of Munros, Corbetts & Donalds, all achievable in a comfortable day’s outing from here. There is also a whole host of very fine, lower level walks, forest trails and short walks (notably the paths around Uath Lochans, in the magnificent Glen Feshie and the 7-mile Wildcat Trail around Newtonmore just 5 minutes down the road). The Badenoch Way runs nearby, the spectacular Corrieyairack Pass is just a short drive away and the long disrance Speyside Way starts (or finishes if you prefer) just 20 minutes up the road in Aviemore. Walkhighlands is the ultimate website for walking and hiking in Scotland. Thousands of free detailed descriptions of walks, places to stay, GPS waypoints, and proper maps. We’re more than happy to provide you with maps, routes and guidance. Drying out and storing your kit at the end of each day is no problem; we have good facilities for both. Our location offer skiers and boarders a choice of venues, doubling your opportunities to get on to the snow and offering different challenges, runs & routes. Just over half an hour away, the Cairngorms are Scotland’s premier ski area, with Downhill, Snowboarding, Telemark and Nordic all well catered for. A little further away, around an hour or so, is the smaller, more intimate Nevis Range for a change of scenery. 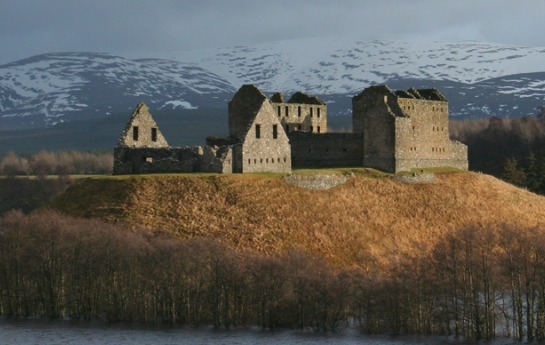 The area in and around Ruthven House is famous for it’s abundance of bird watching opportunities, whether taking a simple walk or visiting the RSPB hide-out on Insh Marshes, you will not be disappointed. From Ospreys to Kingfisher, Woodpeckers to Sandpipers. 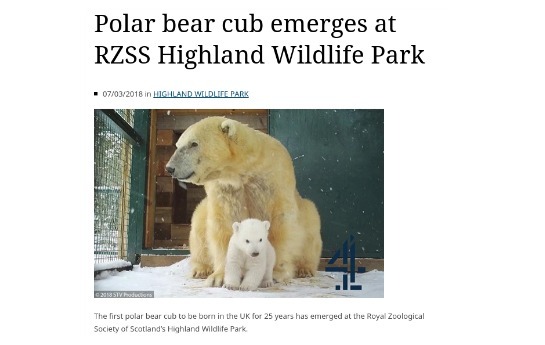 The RSPB website has lots of information. The Ospreys feeding is a sight not to be missed! Enjoy a dram or two of Spey Side’s local whiskies! The Spey River is famous for providing the essential ingredient to the ‘The Water of Life’ or whisky. The region surrounding Ruthven House is known as ‘Malt Whisky Country’. Enjoy visiting the local distilleries or follow the famous Whisky Trail. Whether you are interested in photographing landscapes, buildings, wildlife, birdlife, plants or simply in capturing wonderful holiday images this area offers you loads of opportunities to take some marvellous photos. 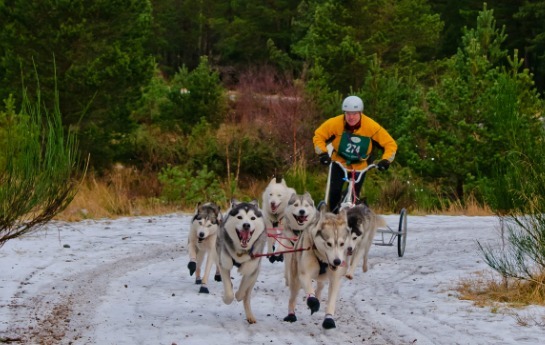 Every year, mushers from throughout the UK gather in the forests around Aviemore for the biggest event in the British husky calendar - always hoping for plenty of the white stuff to make it a real arctic experience. Sled dog enthusiasts continue a racing tradition, which is now almost a century old. Around 200 teams of dogs from all over the country compete annually in the Aviemore area. With competitors ranging in age from just eight to 60, there's something for all the family to see at this great spectator event, which has grown from just a dozen teams in 1984, to more than 200 in recent years. Organised by the Siberian Husky Club of Great Britain the rally is run on tracks around Loch Morlich in the shadow of the Cairngorms. The event is the biggest gathering of its kind in the UK for dogs, which were first bred to pull sleds in Arctic conditions hundreds of years ago. The rally features teams of between two and eight dogs running at up to 20 miles an hour over a gruelling, four-mile track. Along with the Siberian huskies, rally dogs include Alaskan Malamutes, Samoyeds, Greenland Dogs and Canadian Eskimo Dogs. And, even if there's no snow at ground level for the event, the races will still go on with mushers using a three-wheeled rig that looks like a bike without a seat. Sled dogs come from as far as the Isle of Wight and Devon for one of the most challenging and prestigious of the British Siberian Husky Club's series of rallies. Also in the area you can let yourselves in for a real treat by going to watch Neil Ross and his working sheepdog display at Leault Farm, just 10 minutes north of here. Alternatively why not try your hand at Clay Pigeon Shooting, Archery, Gliding, and 4x4 Off Road driving. Beauty treatments? There are some superb local therapists. We would be delighted to help out and arrange any of these activity ideas for you, as you can see there really is a wealth of activities to suit all. If you need any further assistance for ideas, please let us know.